The Northeast Emergency Food Program (NEFP), a program of Ecumenical Ministries of Oregon, believes in a future where people have consistent access to nutritionally adequate and culturally appropriate food. They have worked for more than 30 years to meet families’ emergency and longstanding food and clothing needs through community building and regular pantry hours. However, unsatisfied with the barriers that keep people from making it to the NEFP pantry located in Cully on Wygant and 72nd, NEFP staff developed the Cully Mobile Food Pantry. The Mobile Pantry is currently being ran by staff of NEFP. 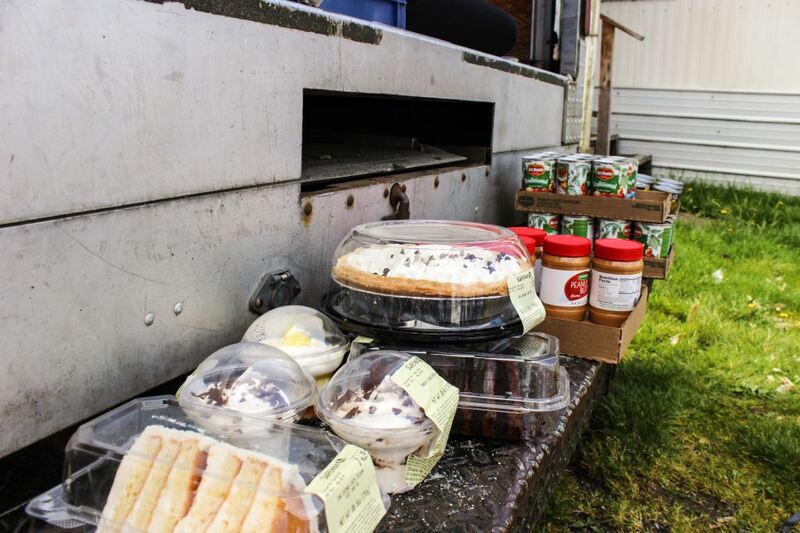 The Mobile Food Pantry brings groceries directly to places that feel safe and comfortable, are convenient to access and do not require invasive documentation. This approach has made a big difference in the number of families NEFP serves. The NEFP team has set up a pantry outside Sacajawea Head Start every Tuesday mornings for about two years. Between 30-60 families shop at this mobile pantry compared to the 4-5 Sacajawea families that made it to the brick and mortar pantry every week previously. In check-in meeting with Sacajawea families it is clear the pantry is both needed and appreciate, said, Elizabeth Jacobsen, Family Services at Sacajawea Head Start. Providing fresh fruits and vegetables offers a free alternative to expensive and inaccessible grocery options in Cully, she emphasized. Having regular access to these foods in homes results in healthier diets for the students and the whole family. The Cully Mobile Food Pantry program is in the process of expanding. 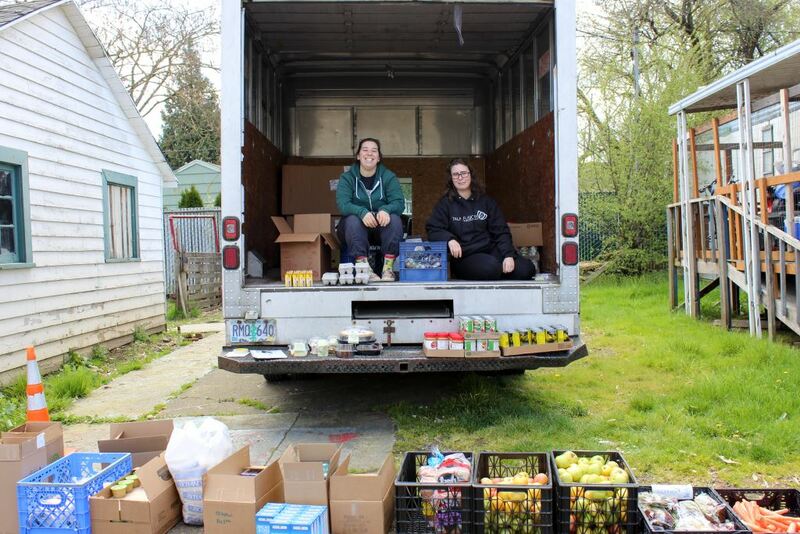 On Wednesday, March 28th Cecilia and Heather drove to the food truck to the Oak Leaf Mobile Home Park where they provided groceries for residents of the Oak Leaf. 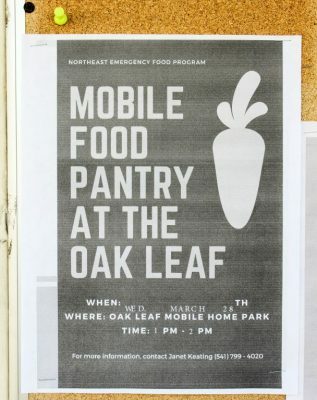 This partnership was made possible by Janet Keating, manager at the Oak Leaf, who surveyed residents to find a time and place that would help homes make it through the end of the month when food stamps run low. Residents come to shop like they would at a grocery store. NEFP offers the full food pyramid at their mobile pantry, said Cecilia. Most of the food comes from the Oregon Food Bank, with additions from grocery store partners like Trader Joes. For this trip, Cecilia picked up some dessert from Safeway to round out their supplies. “Everybody deserves desserts,” she said. NEFP hopes to partner with more community sites to offer regular Mobile Food Pantries, said Travis Niemann, Program Manager. If you or your community organization are interested in collaborating, please contact Travis a nefp@emoregon.org or 503-284-5470.